Tomatoes are nothing to joke about. On first glance? Very cool, clean, fresh. Look at those gorgeous, juicy tomatoes. Beautifully, neatly draped over the little garden sign. Quite modern and makes you want to eat healthy. But yikes, people. 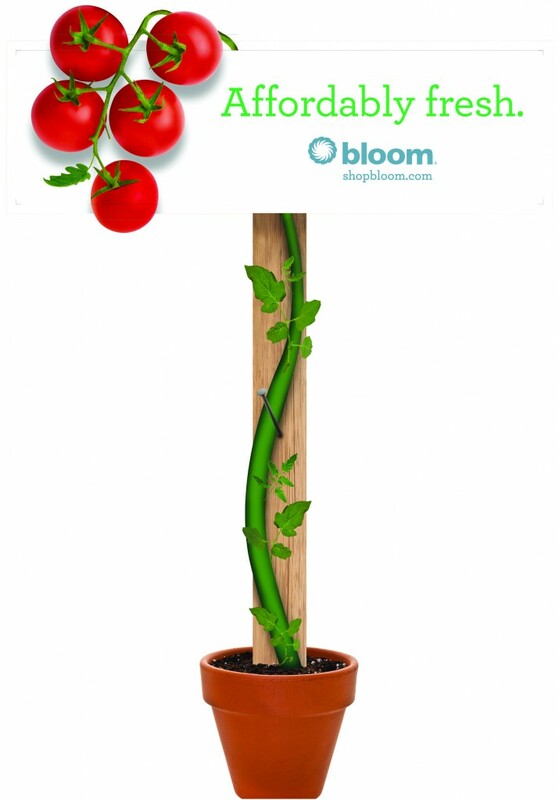 Tomatoes don’t grow like that. I actually enlarged the photo to make sure those were even tomato leaves, because they look so strange, just sort of plunked in like that via photo-editing. Hydroponics, I wondered? Some weird genetically engineered-type tomato plant? And what tomato 5-pack is that exposed? If that many leaves are missing, the dreaded leaf-devouring horn worm can be heard licking his lips nearby. Trust me on that one. Plus, um, tomatoes have to be planted deep. Deeeeeeeep. You can’t just throw one on the window sill. A couple of these boogers can defoliate an entire large tomato plant is jjst a few days. Gross. They actually consume and fatten up to pretty big leaf-green larvae while destroying your tomatoes. They are the devil. So yeah. On first glance this ad is pretty and neat and appealing and very suburban. But I am going to have to say no. I mean-think about the mis-information you are giving our children, Bloom! 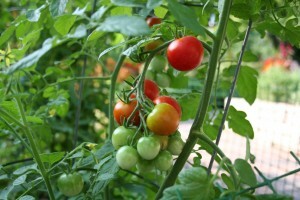 Tomato-growing is space and time-consuming and messy and deep holes and gazillions of leaves and hard-but-o-so-rewarding work. “It’s supposed to be hard. If it wasn’t hard, everyone would do it. The hard… is what makes it great.” -Jimmy Dugan in A League of Their Own(one of my favorite baseball movies of all times…heck, one of my fav movies!). Some google images, tantalizing my tastebuds. 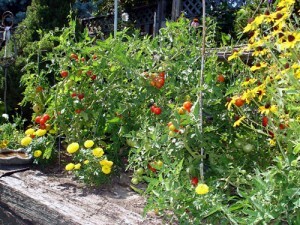 Real tomatoes in real gardens. I apparently take tomato production quite seriously. Who would wear that? Even if it IS true? Did you post this just for me???? Yes. Just for you, Bry. And btw-The Tomato Hornworm doesn’t eat the tomato. Just devours their leaves and kills the whole plant. I guess if you want to be a roly-poly fat green worm with a horn on it?? Hmph. I always thought it would be good to be a tomato worm. You know, being God’s tool for destroying the dreaded mater. But then I realized that I would have to eat them!! Now I just feel sorry for them. I may not be green but I am roly-poly and as far as the horn is concerned I’ve already had mine removed.